Create something no one else has! ​Okay fellow football fans, lets test your vintage throwback trivia knowledge. Check out that football jersey to the right, do you know what team that is? Our long time regular customer Mark M. likes to challenge us with very special jerseys every year and this one took awhile to finish, however the end results is something to show around town. Don't forget, we're only an email away from starting your design and together we can create something fantastic. Write to us at the contact us page below so you can send us your design or your photo and we'll help you put your dream football, baseball, basketball, or hockey jersey to life! Here's another Throwback jersey (left) from the past and ideal jersey for any tailgating party for your favorite team. However, which team is it. We know the answer, but can you guess correctly? 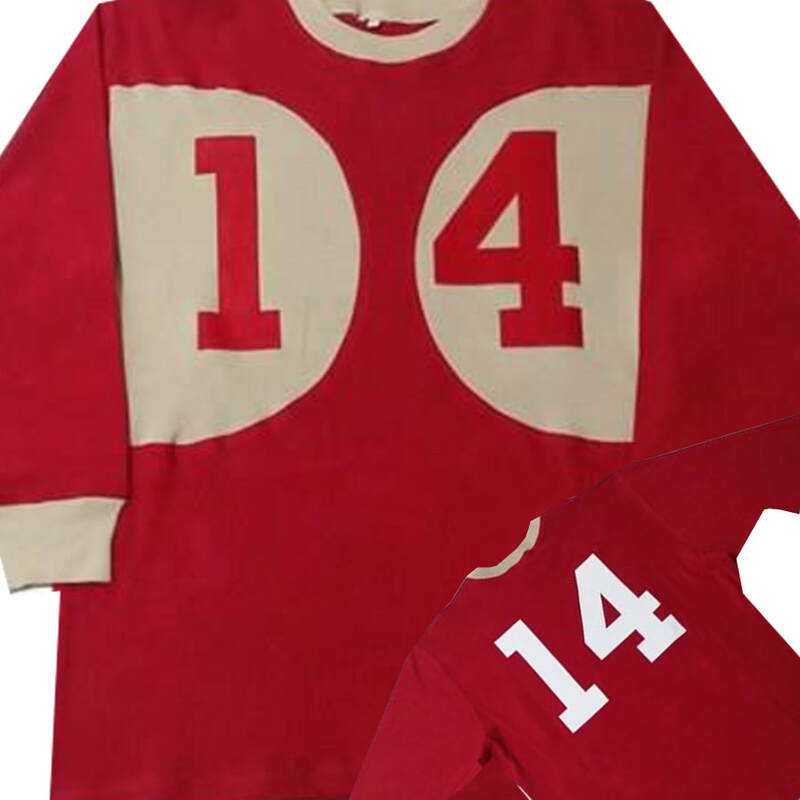 We'd love to hear from you on this rather unique vintage football jersey and the unique colors. Chris K. a long time customer will add this to his ever growing collection of football, baseball, and hockey jerseys. We'd love to see something unique! Here was another challenge by Mark M. (see right). Mark wanted something that looked 100 years old. Can you name this team? Its a very thick long sleeve jersey with additional panels to assist runners in holding on to the football. The center logo was done in cheniele which gives it that old school look. It weighes nearly 2 lbs. Please send us your design and we'd love to help you make something one of a kind. WOULD YOU LIKE A JERSEY FOR THE ENTIRE TEAM? 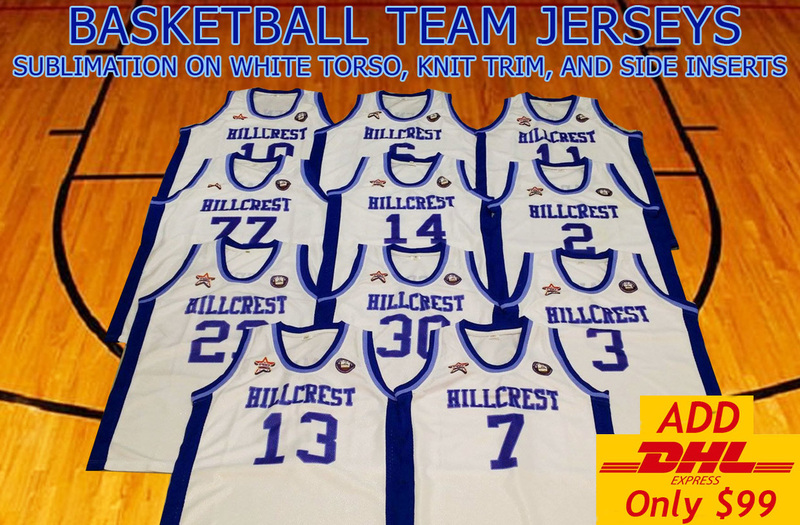 Please contact us if you have basketball team jerseys you need to order. We'd love to see your design. HOW ABOUT YOUR PHOTO WITH YOUR OLD JERSEY? Wouldn't you love to have something like this for your house of office? We did this portrait/jersey as a sample for you to see a new home or office concept to decorate your large empty wall with a truly high quality piece of art. This combination of having a real top quality professional artist hand paint a portrait of your family member from a photo and have it framed next to wearable jersey offering the highest quality materials is something to marvel at. 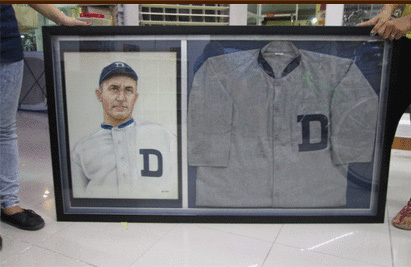 As you can see in the photo on your left, we had our artist hand paint a portrait of Ty Cobb and we had it framed and matted next to a vintage wool Tigers jersey similar to what was worn in the day. So imagine having something like this in your home of your son, dad, mom, daughter or favorite all time player. Contact us if you're interested in a project like this for your home of office. Are you excited about the next big event and don't know what to wear? Well, you've come to the right website. We offer one of a kind jerseys that are exclusive to only the people ordering them. We're the folks to make sure you stand out at the game. Nearly nothing is impossible. If you can think it, we feel we can do it! You can order your own do-it-yourself creation by just writing to us, send us a photo or design and letting us know what you would like. What makes us different? We use great materials, creativity and we have an attention to detail. 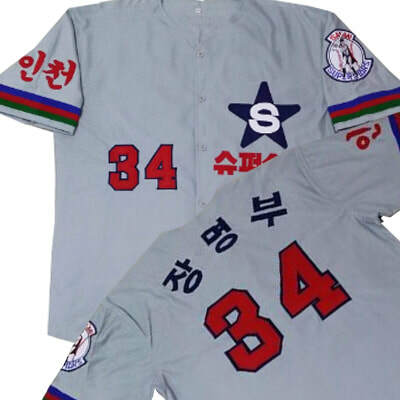 We're also big time collectors of jerseys for so many years giving us the expertise needed on each and every order. You can order your old high school jersey for framing or homecoming games, pop warner or midget football jersey, college jersey or your concept of a new design. Being a part of a pre-game tailgate group or section is quite an experience. If you truly want to stand out, please contact us now and we'll help you work through all the details. We are extremely passionate about the work we do, so please write now and lets see what we can do together. We don't do order forms where you choose colors and styles, we want to with each customers directly on a one on one basis so that our communication is solid on what you want the final product to look like. Just keep checking your emails. HOW TO MEASURE YOUR SIZE AND SIZE CHART, NOT ALL JERSEYS ARE CREATED EQUAL! Since 2001, we've received requests for the ultimate Tailgating jersey. Here's a list of our top 100 jersey requests. Not all jersey requests can be done. Please communicate with us with your photos and ideas, size dimensions, and as many details as possible. The late 1800's, early 1900's styles are our favorites to do. 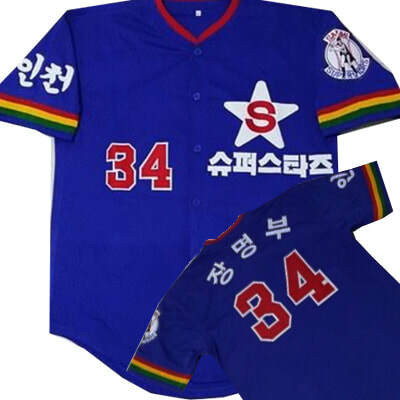 Sorry, can help you with modern jerseys or modern players that bare any trademark. Come up with a good idea, send us photo and we'll help your DIY project. Here's Joe, the License Plate Guy famous for sharing his good luck for the New York Giants. What else can you say about Joe, he follows the Giants where ever they go. A truly dedicated fan....I saw that the NFL Network did a feature presentation on Joe during 2012 at this home, it was a great show. Joe is still in great shape and I'll bet if the Giants let him carry the ball, he could gain a few yards if the Giants FB was doing the lead blocking. Joe, still young enough and has many years ahead of him, however, he has truly trained his daughter Bella all about the Giants to take over for him and be "Next in Line". Presentation to Coach Worsley: "Incredibly the jerseys arrived today in time for tomorrow's presentation. They are amazing, what a great job. Thanks so much, Charlie K."
Where do I begin, what a FANTASTIC jersey! The material, numbers, quality of the design, and the way it fits are beyond words! Thank you so much, will be in touch for another order in the future! What can I say , the jersey is PERFECT and that word doesn't even do it justice ! Thank you SO much, you do beautiful work. I appreciate all your efforts and trying so hard to make this jersey a masterpiece. I'm going to take a picture with me and this awesome jersey and send it to you ! Great jersey! I received it yesterday. can`t wait to wear it to the stadium. Reminds me of that great 1977 Orange crush season. Received the jersey today. It's outstanding ! Thank You. Frank P.